TULSA, Okla. - April 14, 2018 - PRLog -- When the touring show Beatles vs. Stones – A Musical Showdown comes to the Tulsa Performing Arts Center on May 13, the Union High School (Tulsa) String Quartet will have the privilege of joining the professional musicians on stage to add some orchestral texture to the evening. The show: The two greatest rock 'n' roll bands of all time face off in Beatles vs. Stones - A Musical Showdown. Taking the side of the Fab Four is Abbey Road, one of the nation's top Beatles tribute bands. With brilliant musicianship and authentic costumes and gear, Abbey Road plays beloved songs spanning the Beatles' career. They engage in a "showdown" of the hits with Stones tribute band Satisfaction - The International Rolling Stones Show, who offer a faithful rendition of the music and style of Mick Jagger, Keith Richards and the bad boys of the British Invasion. The production includes multimedia, period costumes and vintage instruments. It has toured for years, with a critic for the Los Angeles Times at one point declaring: "this is the most unique tribute show in decades." The Tulsa show is part of a 125 city tour of the U.S., Canada and Australia. 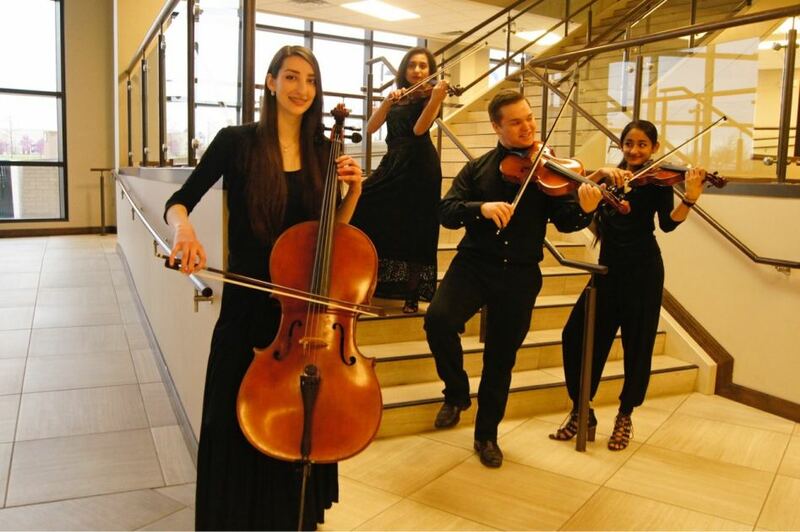 The string quartet: Union High seniors Maha Narayanan, Kassandra Goana, Jennifer Ripley and sophomore Keegan Knouse will join the bands for the songs "Eleanor Rigby," "Yesterday," "A Day in the Life," "Hello Goodbye," "Hey Jude," "As Tears Go By," and "Ruby Tuesday." The Union String Quartet consistently receives Superior ratings at state level competitions. Quartet member belong to prestigious area ensembles, including the Tulsa Youth Symphony, OKC All-State Honors Orchestra, and Oklahoma Art Institute Orchestra (OAIO). How the "Beatles" and "Stones" connection was started: The producers of Beatles vs. Stones approached Union High Orchestra Director Paula Surface looking for a talented ensemble which could hold their own with a rock band in front of an audience. The show commonly hires a local quartet to augment the production while on tour. The quartet's Beatles or Stones fans: Jennifer Ripley and Keegan Knouse are the quartet's Beatles fans. "'Eleanor Rigby' is my favorite song. My parents always listen to oldies music on road trips and car rides so hearing this song brings up those good memories," said Jennifer. The details: Two of the greatest bands of all time face off in a high-energy, adrenaline-pumping musical showdown. The Fab Four, represented by tribute band Abbey Road will engage in a barrage of hits against premier Rolling Stones tribute band Satisfaction. "Beatles vs. Stones – A Musical Showdown" comes to the Tulsa Performing Arts Center onSunday, May 13 at 7:00 pm. Tickets are $25-$65 and may be purchased by phone at ((918) 596-7111 at the Theatre Box Office or online at www.myticketoffice.com. The Tulsa PAC is located at 110 E. 2nd Street, Tulsa, OK 74103. The show is appropriate for all ages. Maha Narayanan,18,began playing violin when she was eight and has been playing in the orchestral setting since sixth grade. She was a recent finalist for the All-State Solo and Ensemble Competition. "I love orchestra and how you never really lose the teamwork value because you need to work as a group in order to perform beautiful music." Maha will attend University of Oklahoma on an academic scholarship and major in Biomedical Engineering. Kassandra Goana,18, has been playing violin since sixth grade. She has been competing in solo and ensembles festivals since seventh grade and has advanced to the state level in each of the past two years. "I like string instruments, but bass and cello are too big for my small physique, and I really liked how the violin sounded so I decided to play it." In her free time, she likes to volunteer at her church, teaching altar children. She plans on attending Oklahoma State University and majoring in Accounting. Keegan Knouse,16, has been playing viola for five years. He has been a member of the Tulsa Youth Symphony. He is in the top 1% of his class and will become a National Merit Scholar this year. "Playing viola is a good release of energy. There is an emotional experience with music, with each song giving you a new story to tell, allowing you to connect to life and certain people in different ways that you might not otherwise get without music," Keegan said. Aside from viola, he also plays the flute, clarinet, piano, violin, and alto saxophone. After his senior year, he plans to attend a four year college, double majoring in music education and premedical biology. He hopes to teach music while earning his medical doctorate. Jennifer Ripley,18, has been playing cello for seven years. In this time, she has played for the Tulsa Youth Symphony for five years, the OCKAS for the past three and OSAI summer program last year. The salutatorian of the 2018 class, she plans on attending the University of Tulsa and majoring in Music. She plans to continue to play the cello for an orchestra or chamber group. The Beatles bring up good memories of "road trips and car rides with my parents." Her favorite song is "Eleanor Rigby." "It's really fun being able to express myself through music and it's something I'm actually good at," she said.